In conjunction with the on-going Ramadhan and upcoming Aidilfitri, renowned game store Gamer’s Hideout is offering what they called as “The Ultimate PS4 Bundle”. It consisted of the console itself as well as PlayStation Camera, DualShock 4 charging station, PS4 vertical stand, PlayStation Gold Wireless Stereo Headset and two DualShock 4 controllers. Short of a game, TV, and internet connection, the bundle is pretty much everything you need to get into the PlayStation 4 world immediately. 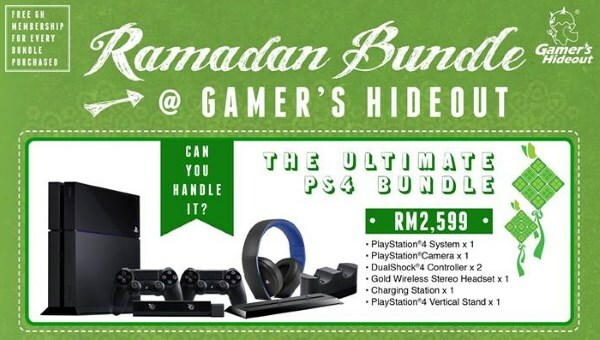 Apart from the mega bundle, GH is also offering a number of other PS4 bundles under its Ramadhan promotion. With savings of up to RM 259, the available selection include the PS4 headset bundle, PS4 controller bundle and PS4 camera bundle. 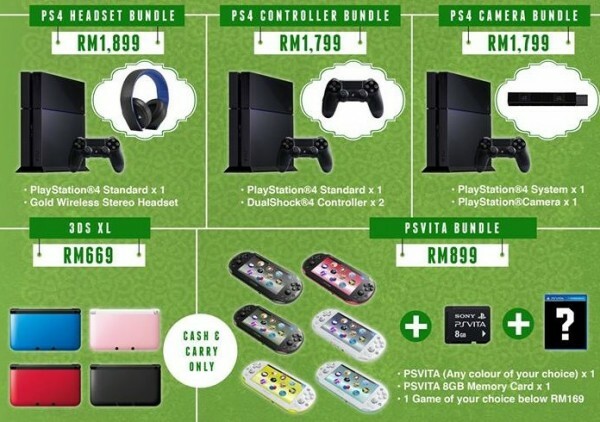 In addition to all the bundles above, GH has also listed PS Vita Bundle and stand-alone Nintendo 3DS XL in the promo but they are obtainable only at GH outlets. As for the previously mentioned PS4 bundles, they are available for delivery. For more details or further clarification, do get in touch directly with the Gamer’s Hideout through its Facebook page.